For the replacement of most Lucas-distributors used in Rover-V8 engines. Not only is the array of nicely spaced advance-curves valuable for tuning a particular V8-engine, the manual also gives a cross-reference-list, linking most original Lucas distributors with a switch-position of the 123\ROVER-8-R-V. 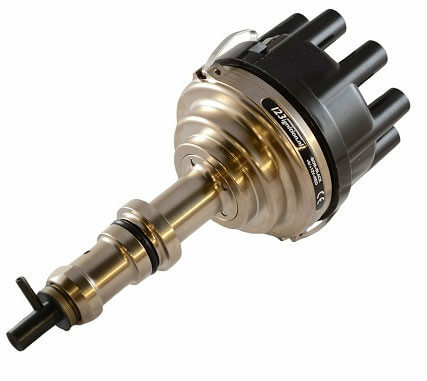 The unit comes as shown in the picture, with a 1/2″ axle, so that the drivedog from the original mechanical distributor can be easily mounted. IMPORTANT : the 123\ROVER-8-R-V is primarily suitable for SD1-engines as produced from 1976. Rover P5 & P6, early Range Rover and MGB are all “pre-SD1”. An LED for easy static timing is integrated into the 123 ; the design is laid-out in such a way that the static timingmark ( at Top-Dead-Center) of the engine can be used. The designers have put a tremendous amount of effort into this product, not only to make it work for mild road use, but also for racing applications. The electronics control the dwell with such perfection, that it takes the primary resistance of the coil into account, the battery voltage, temperature of the electronic-circuitry, in order to deliver the maximum amount of energy to each spark. The amount of energy is exactly the same for each cylinder, always. This, AND the 123-spark-balancing feature, leads to a wonderfully smooth running engine, that will perform like new. There are 4 groups of 4 advance-curves. Each group has a certain maximum advance ( 20, 24, 28 & 32 degrees crankshaft ), and within a group there are 4 options for steepness of the curve towards 2400 rpm. These features will enable the knowledgeable tuner to easily optimise the performance of any give Rover-V8-engine!